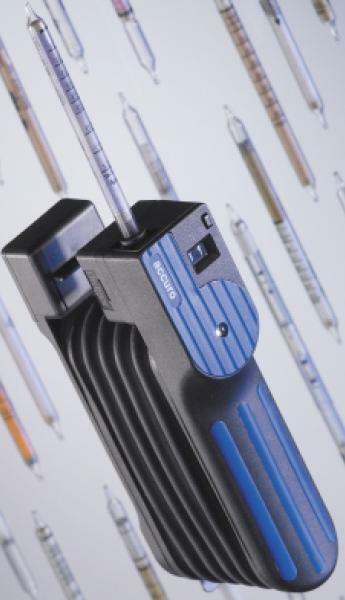 Most Trusted - Drager Tubes have been leading the way in gas detection for over 60 years. Widest Range - Over 200 different Drager Tubes are available for measuring over 500 gases and vapors. Hassle-Free Operation - No calibration, no lubrication, no special maintenance. Always ready to go. What is the Drager Tube system? - Drager Tubes are glass vials filled with a chemical reagent that reacts to a specific chemical or family of chemicals. A calibrated 100 ml sample of air is drawn through the tube with the Drager Accuro bellows pump. If the targeted chemical(s) is present the reagent in the tube changes color and the length of the color change typically indicates the measured concentration. The Drager Tube System is the world's most popular form of gas detection..
Drager: Leading Detection - Ever since 1937 when we introduced our first detector tube, Drager has been the world leader in the analysis of gases and vapors in the industrial workplace. Over the years we have developed more tubes and detection devices for more applications than anyone else! Our leading edge technology has kept us on the forefront of colorimetric detector tubes thus providing the most accurate and specific results available. Accurate - Not all detector tubes are created equal! Drager Tubes with the accuro pump deliver the most accurate results. Many Drager tubes offer a +/- 10% standard deviation on the results. This is a result of our 60+ years of manufacturing colorimetric tubes and the consistent volume delivered by the bellows pump design. Quality assurance is accomplished by individually calibrating each batch of Drager Tubes. Then every batch is tested at regular intervals, throughout the two year shelf life, to guarantee accuracy over the entire life of the tubes. Easy To Read - See the difference for yourself! The wider diameter of the Drager Tubes makes it easier to read. Well-spaced graduation marks enable distinct and decisive measurement results. Color changes to the reagents are well defined over the entire length of the stain. Many Tubes offer a dual calibrated scale so that you can interpret the results without using multiplication factors. Fast - One stroke tubes are not always faster! Though many Drager Tubes require more than one stroke, they often provide measurement results in less time. Not only do you get the benefit of a quicker analysis; the larger sample volume provides better statistical accuracy. Flexible - Drager Tubes simply deliver more! More gases and more measuring ranges than any other manufacturer. Drager offers over 200 tubes for accurately measuring over 500 different gases. You can measure ambient air for health and safety levels, optional equipment allows you to measure stack gases, motor vehicle exhaust components, pressurized gas line samples, compressed air contaminants, and solvents in water samples. Other specialized tubes measure over a period of hours or a complete work shift to indicate daily exposure levels. Specitifc - Reagents used in Drager Tubes are chosen to provide not only the most accurate, but also the most specific results possible. Our use of prelayers on many tubes (like benzene) remove other potential interfering gases (e.g. aromatic hydrocarbons) so you measure only the targeted chemical, getting only the results you want. This design enables you to measure specific gases in a complex ambient background found in the measurement area. Maintenance Free - Drager has made gas detection easy. Unlike a piston pump, the accuro pump requires no lubrication. The Accuro is constructed of non-metallic, corrosion resistant materials. It can't be bent by rough treatment and it withstands harsh chemical environments. Drager Tubes are pre-calibrated for two years. The only requisite on Drager Tubes is that they are stored out of direct sunlight and at a temperature of less than 25°C (77°F). Any temperature-controlled office meets these conditions. Drager-Tube	-	Measuring	-	Order No.